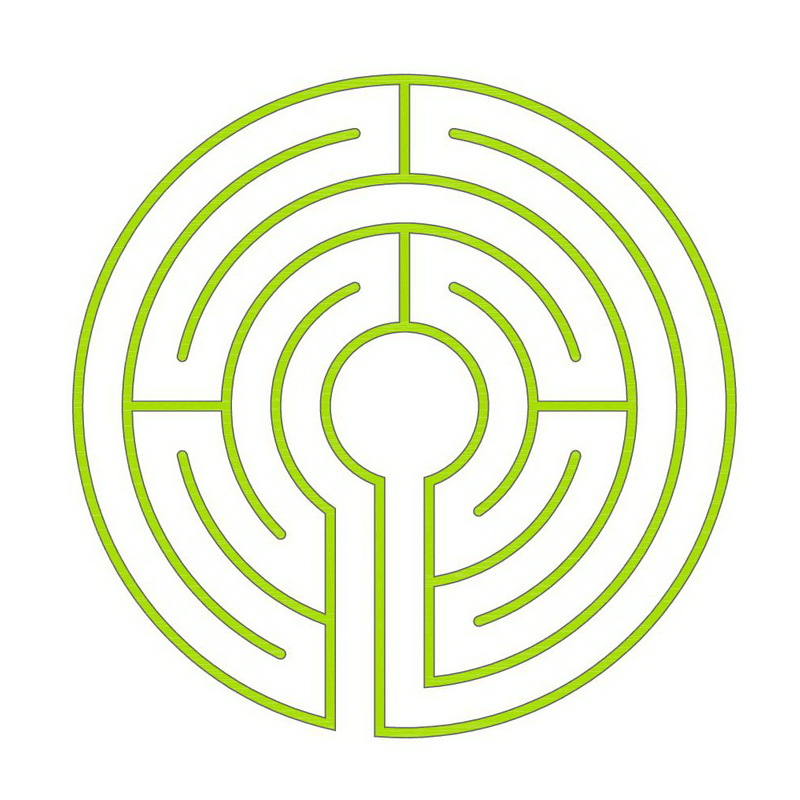 The Chartres labyrinth occurs in many variations. 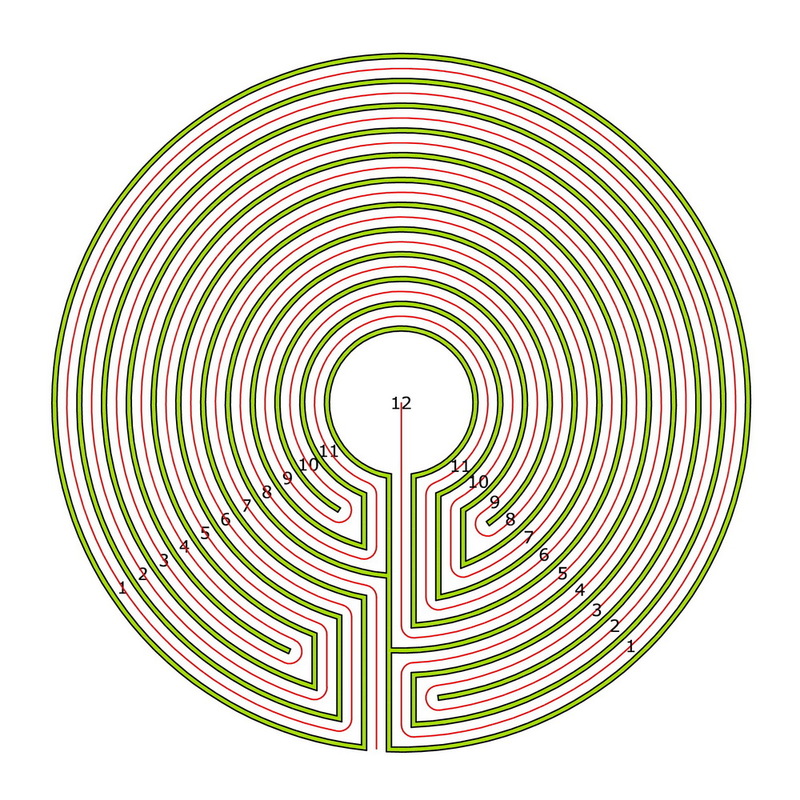 Here I speak of the 11 circuit Chartres labyrinth as a type. 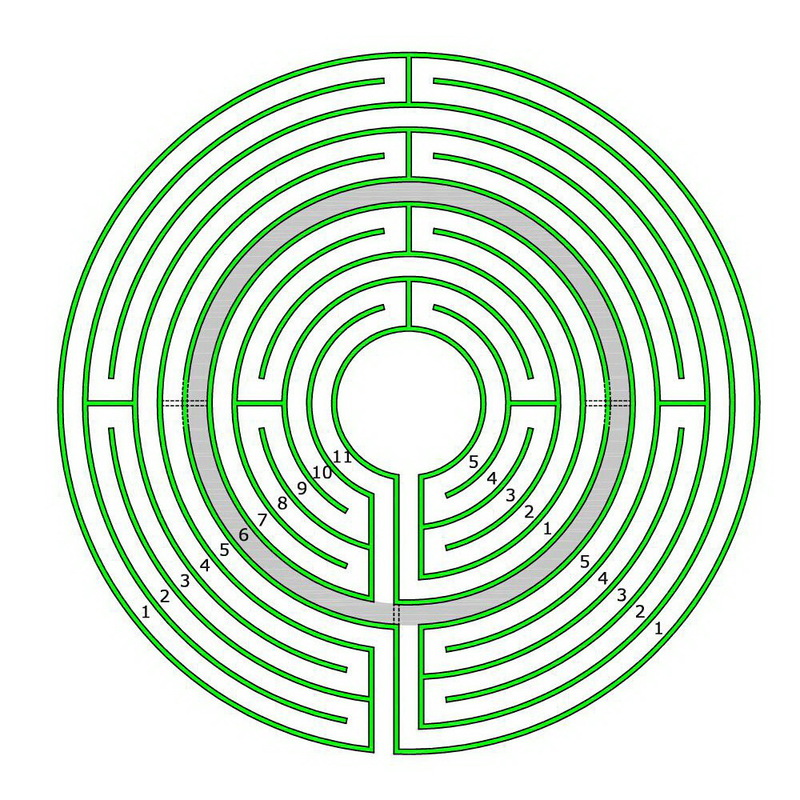 Some elements of the original labyrinth in the Cathedral at Chartres, such as the six petals in the middle and the lunations around the outermost perimeter, belong to the style Chartres. For me the type Chartres exists above all in the layout of the paths. One goes in quickly (on the 5th circuit) and one quickly approaches the middle (6th and 11th circuit). Then follows the wandering through all quadrants. The access of the centre happens from completely outside (1st circuit) quickly about the 6th and 7th circuit into the centre. 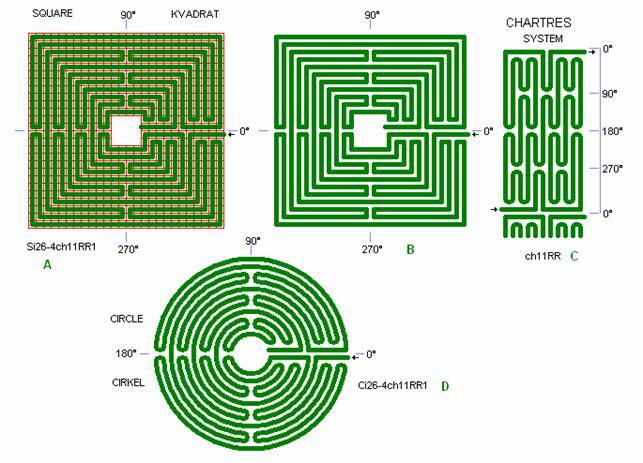 Theoretically there are lot of possibilities to build similar types to the Chartres labyrinth. They can be found worldwide. However, the original Chartres labyrinth owns many special qualities which make it an extraordinary example among the Medieval labyrinths. Among others, it is self-dual and symmetrical. Hence, the original can be divided in labyrinthine mathematics (11:2=5) in two equal labyrinths. I cut it into two parts, by omitting the 6th circuit. Thereby I get two new, yet identical 5 circuit labyrinths in a Chartres-like layout: I quickly reach the middle and finally enter the centre directly from the outermost circuit. The way in between shows the labyrinthine pendular movement, that Hermann Kern describes as characteristic for a labyrinth. 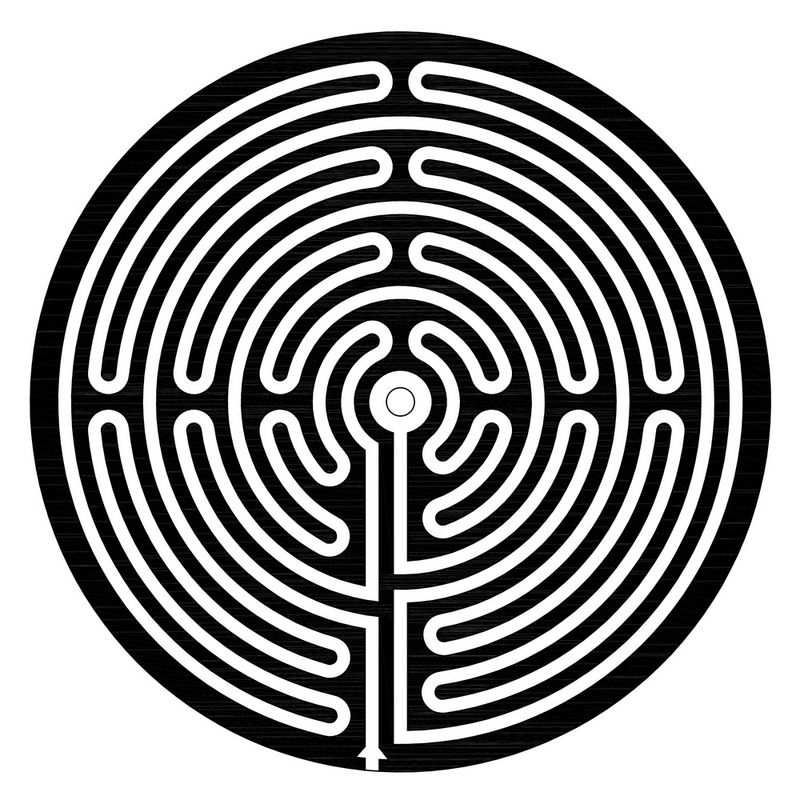 How should we now name this type of labyrinth? 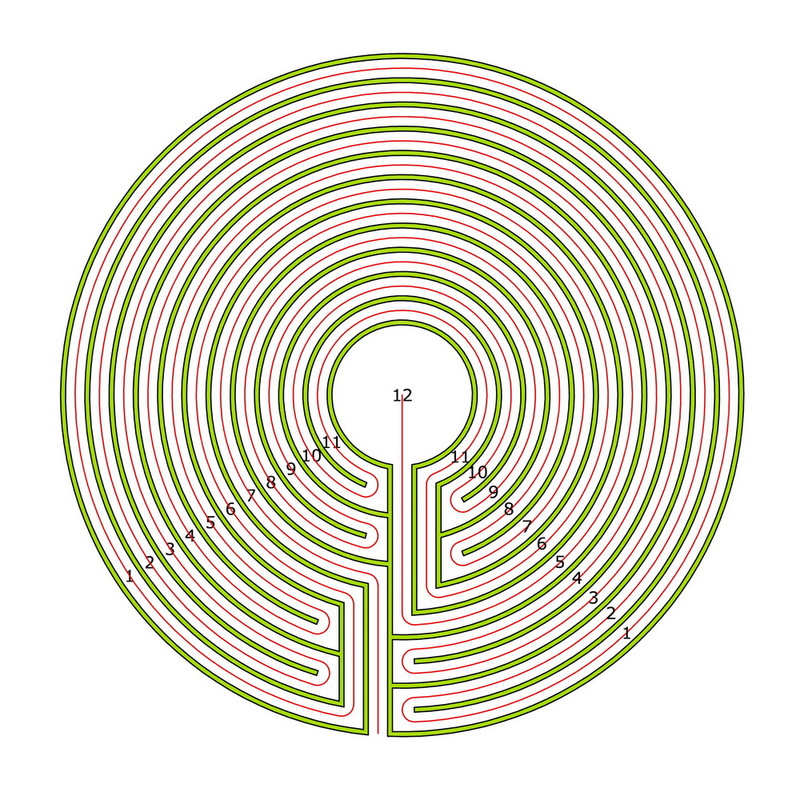 To me the name 5 circuit Chartres labyrinth seems properly to differentiate it from other 5 circuit Medieval labyrinths with another layout for the paths. I would like to call it Demi-Chartres. The Babylonian visceral labyrinths have found entrance in the modern medicine. In quite an unusual way. 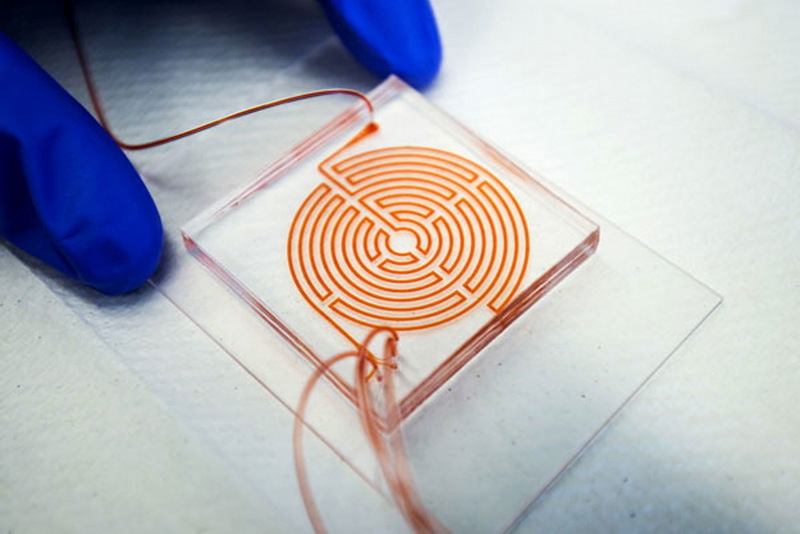 A labyrinth-like chip serves for the diagnosis of cancer cells in the blood. The labyrinthine arrangement of the fluid channels shows up to be an effective tool to isolate circulating cancer cells in the blood. That means that the curvature and the tortuous route in the labyrinth is especially useful. What kind of labyrinth is this now? At first sight it reminds of a medieval labyrinth, as it is the famous Chartres labyrinth. It has ten circuits in three sectors, in one these are eight. They will not be traversed one after the other, but reciprocally. And then it has two accesses: An entrance and an exit. 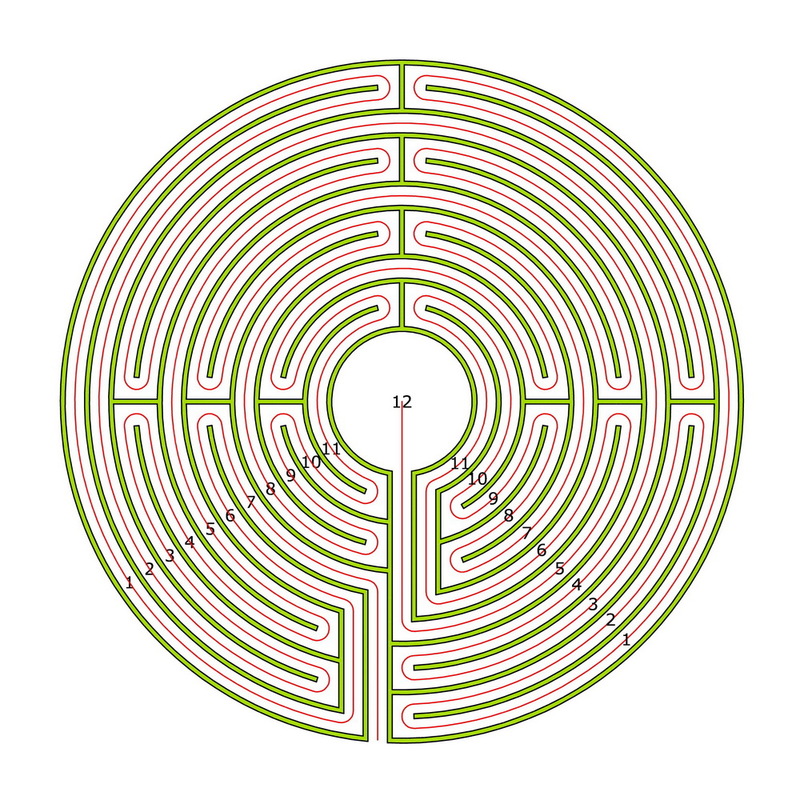 It is a walk-through labyrinth as we know that of the Babylonian labyrinths. Hence, we have an own, new type. And we see the pathway in the labyrinth, Ariadne’s thread. This reminds us of the Greek myth of the Minotaur, which is to be combated like cancer here. If the Babylonian visceral labyrinths served for the divination, here the labyrinth serves the medicine. This reminds me of “Ancient Myths & Modern Uses“, the book about labyrinths of Sig Lonegren. The paths and the limitation lines are each 40 cm wide. The paths are formed by 6 rows of bright granite stones, the limitation lines by 7 rows of dark stones. The middle has a diameter of 1.80 m, built of 8 rows of bright stones and the center piece measures 80 cm in diameter. The center piece is formed by one single plate of reddish granite with a width of 80 cm and has a slightly convex shape. The paths and lines are framed by 7 rows of dark stones in a width of about 77 cm. The paved surface has therefore a diameter of 21 m. A 2.50-m-wide way from grit joins this, surrounded by bigger fieldstones. The path length from the outside up to the central midpoint amounts to a total of 371 m.
The labyrinth ist to be recognized on Google Earth. 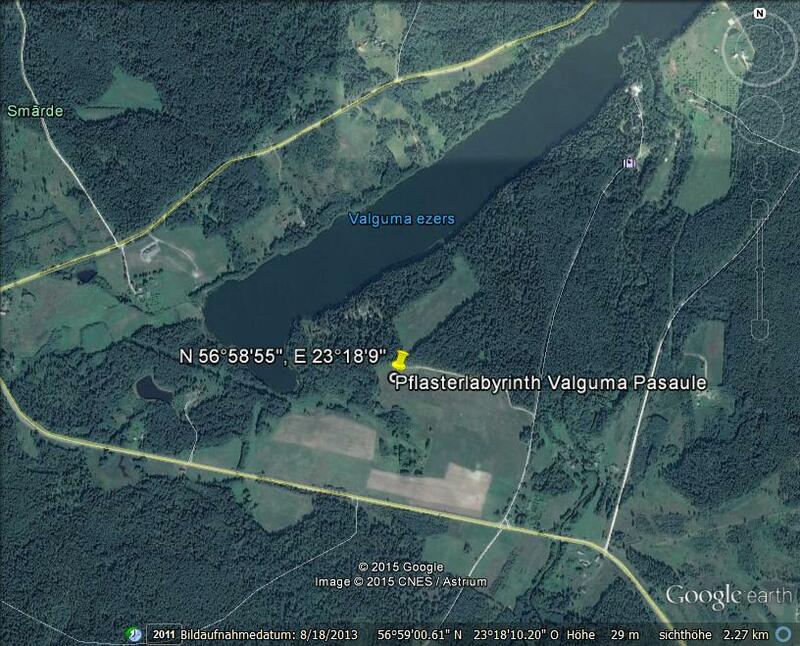 The geographic coordinates are N 56° 58′ 55″, E 23° 18′ 9″. What’s the Use of the Pattern? Many of those who are involved with labyrinths use the rectangular form, e.g. Jo Edkins, Niels Mejlhede Jensen, some authors in Caerdroia and many others. Erwin and myself have used it in many posts on this blog. Not all use the same rectangular form and not all use it the same way. However they all intend to achieve a better understanding of the labyrinth. 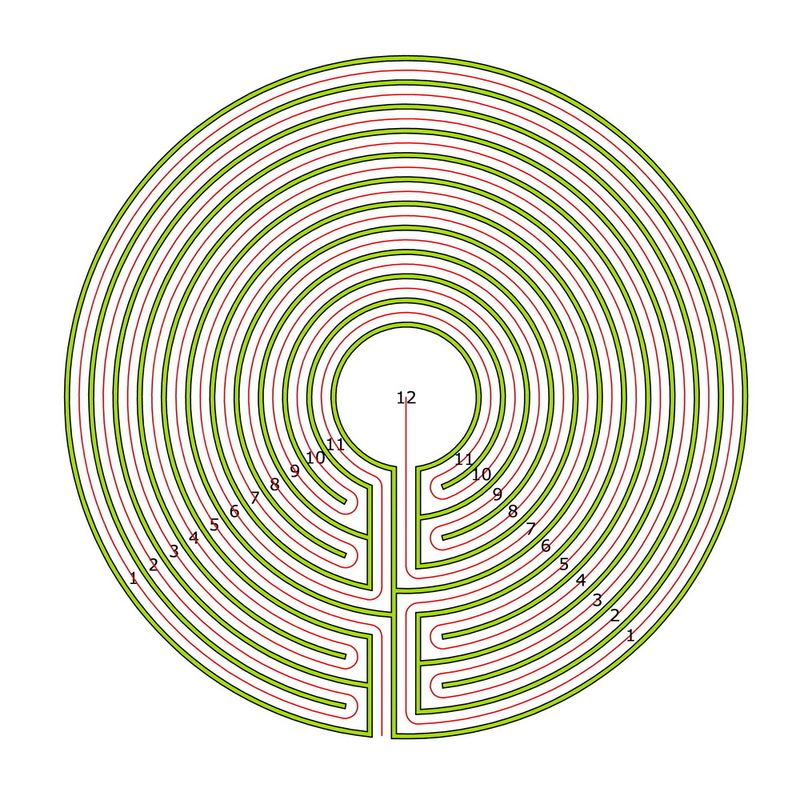 In the following I show some examples with the rectangular form of the Chartres labyrinth. Thorn Steafel (fig. 1) uses the rectangular form for the walls obtained with method 1 in order to compare the patterns of the Chartres and the Bayeux labyrinths (Steafel T. Reappraising the Bayeux Labyrinth. Caerdroia 2014; 43: 40-45). Jo Edkins shows on his website the rectangular form for the Ariadne’s Thread using method 1 and analyzes the course of the pathway (fig. 2). The same rectangular form (for the Ariadne’s Thread, applying method 1) is used by Erwin in this post (fig. 3). 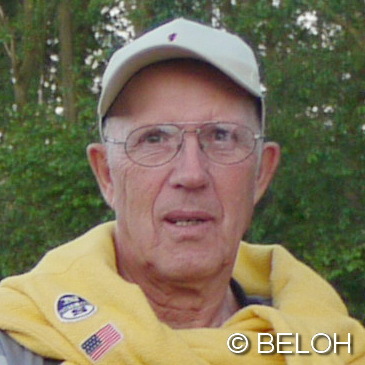 He analyzes the course of the pathway and the duality. This latter can be seen in the different numberings of the circuits on the left and right outer sides. 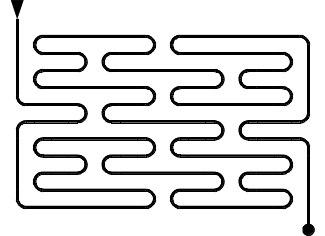 In all three rectangular forms obtained with method 1, the entrance is at bottom right and the center on top left. Since it can be read from top left to bottom right, I always use the rectangular form for the Ariadne’s Thread obtained with method 2 (fig. 4). This is the form I refer to as the pattern. 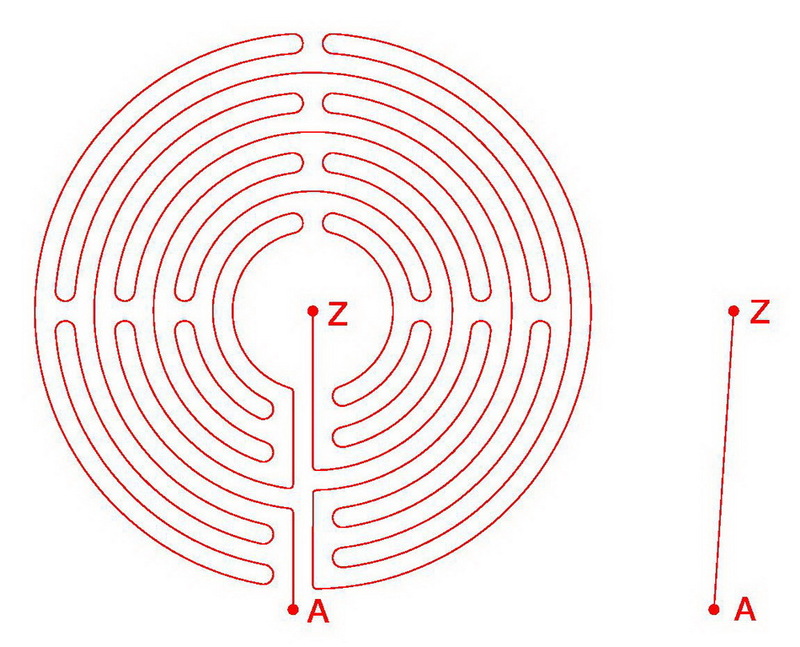 The pattern provides an unambigous criterion for grouping similar and distinguishing between different labyrinths. 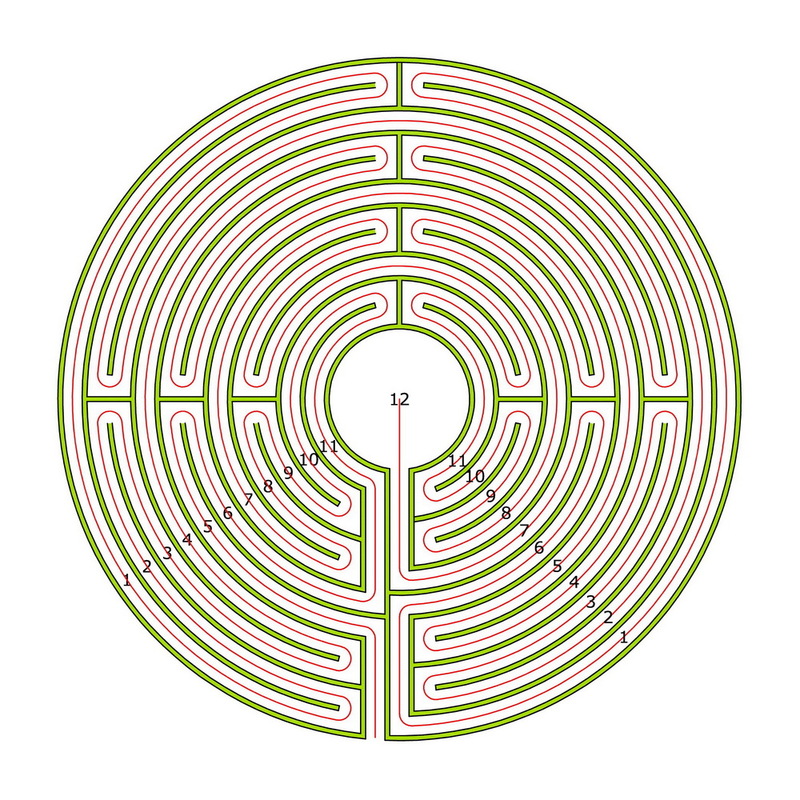 Recently you could read something about the long and winding path in a classical labyrinth. 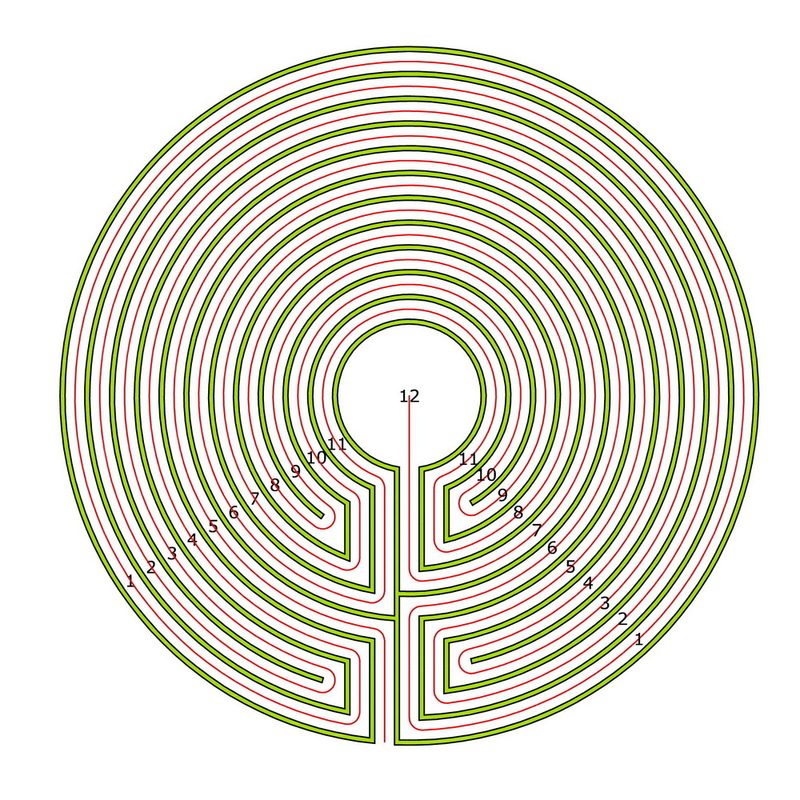 Today we want to look more exactly at the path in the Chartres labyrinth. This is quite an other type of labyrinth. It has more circuits than the Cretan labyrinth, eleven instead of seven. We orientate by the original, that is since about 800 years on the floor inside the cathedral of Chartres. The ways are much smaller than they should be for a “open land labyrinth”. It depends not only on the type labyrinth, how long the ways are, but also from the constructive form. So: How wide the ways are, how wide the boundary lines are in between, how big the middle is etc. In the Chartres labyrinth we have a distance of 42.6 cm from axis to axis. The direct way from “A” to “Z” straight across all boundary lines to the center of the Chartres labyrinth amounts to 6.45 m. This corresponds to half a diameter of 12.90 m.
The whole, long way from the entrance into the center amounts to 263.05 m by following all the turns. This proves a relation between the long and the short distance of 263.05: 6.45 = 40.78. So a much higher “detour factor” than in the Cretan labyrinth. If I handle the thread at the beginning and at the end and stretch it apart, I will get a straight line which reaches from “A” to “Z” and which corresponds to the way into the middle, that is 263.05 m.
If I join together the beginning and the end, I will get a circle. The circumference corresponds to the straight line of 263.05 m. The diameter would be 83.73 m.
I can also make a square with the same size from it. Then this would have four side lengths of 65.76 m.
Don’t be surprised that the original labyrinth looks so tiny. This is due to the “detour factor” of 40.78. (To keep in memory: For the Cretan labyrinth this value amounts to 24.4). The unrolled thread of Ariadne is much longer relative to the original labyrinth. The proportions in the drawing however are right.